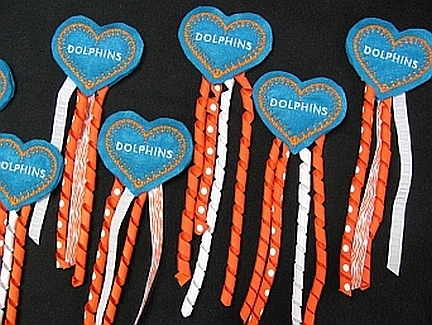 A felt embroidered Dolphins heart with 6 inch dangling ribbons will look great in your Dolphins fan's hair at school or on Game Day! Comes with a snap clip, pony-0, and pinback allowing you to wear it several ways, making it a versatile accessory! Ribbons will vary.